That’s according to Spanish outlet Don Balon, who also claim Barca look likely to try their luck with a bid for Pogba again this winter. MORE: What time does transfer deadline day end for European clubs and which leagues can still make signings? 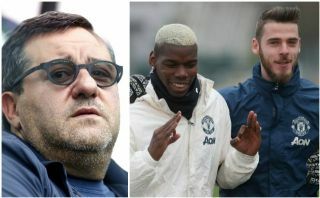 The France international’s agent Raiola is one of the best in the business and represents some of the biggest names in world football for a reason. It remains to be seen if he can orchestrate a move for Pogba to Barcelona this season, but it certainly seems that efforts will be made for that to happen after his client’s struggles in Manchester. Pogba, 25, has rarely looked his usual self in a United shirt, having shone as one of the best midfielders in the world while at Juventus. He also looked much-improved for the French national team this summer, playing a starring role in their World Cup success in Russia. Pogba could clearly fit in well at a club like Barcelona, and it makes sense that he might want to escape this sinking ship at Old Trafford for a move to an elite European super-club. The Telegraph report that Ed Woodward has made four players unsellable at United – Anthony Martial, Marcus Rashford, Jesse Lingard and Luke Shaw, and it’s notable that Pogba is not one of those.